As we spin up Disrupt:OPS we are beginning to post cloud-specific content over there, mixing theory with practical how-to guidance. Not to worry! We have plenty of content still planned for Securosis. But we haven’t added any staff at Securosis so there is only so much we can write. In the meantime, linking to non-product posts from Securosis should help ensure you don’t lose sleep over missing even a single cloud-related blog entry. So here’s #1 from the Disrupt:Ops hit parade! The accidental (or deliberate) exposure of sensitive data on Amazon S3 is one of those deceptively complex issues. On the surface it seems entirely simple to avoid, yet despite wide awareness we see a constant stream of public exposures and embarrassments, combined with a healthy dollop of misunderstanding and victim blaming. This entry was posted in Uncategorized on October 11, 2018 by info@securosis.com (Securosis). Trust between journalists and their sources is paramount. When first approached by journalists, sources or subjects of stories can often be skeptical of a journalist’s motives—or even question whether they are really a journalist at all. Reporters often find themselves in life or death situations when when speaking with members of armed militias, accused terrorists, government rebels, or in myriad other cases. So every time a government agent impersonates a journalist to conduct its own investigation, they are putting countless other real journalists at physical risk. Yet for years, the FBI has engaged in the impersonation of journalists and has defended its practice at the highest level—while keeping its exact policies that govern the tactic. Thanks to documents released as part of a Freedom of Information Act lawsuit by Reporters Committee for Freedom of the Press, we now know a little more. Back in 2007, a man identifying himself as a reporter with the Associated Press approached a 15 year old high school student online and asked him to review an article about threats to his school for accuracy. But he wasn’t a real reporter, and it wasn’t real article. Instead, the man was a FBI agent impersonating a journalist in an attempt to catch a suspect accused of making bomb threats. The faked article sent to the student included malware that revealed his computer’s location and IP address, allowing the FBI to confirm details about the suspect’s identity. When this became public in 2015, backlash from the press and public was swift and intense. Press freedom advocates and the Associated Press itself raised serious concerns that this tactic could endanger journalists and undermine public trust in news gathering. "This latest revelation of how the FBI misappropriated the trusted name of The Associated Press doubles our concern and outrage...about how the agency's unacceptable tactics undermine AP and the vital distinction between the government and the press," Kathleen Carroll, then-execute editor of the AP, said in a statement. Despite the criticism, then-FBI director James Comey defended the agency impersonating journalists in the New York Times, and the FBI’s inspector general also signed off on the controversial practice. In an even more disturbing incident in 2015, FBI posed as a documentary filmmaker crew in order to gain the trust of a group of ranchers engaged in an armed standoff with the government. The fake crew recorded hundreds of hours of video and audio and spent months with the ranchers pretending to make a documentary. In response to these harrowing incidents, Reporters Committee for Freedom of the Press (RCFP) has been working to uncover the details of FBI’s tactic of impersonating journalists. It is engaged in multiple FOIA lawsuits about the practice—one that relates to the AP case from 2007, and one about impersonation of filmmakers, which led to this most recent disclosure. This week, after fighting the government for years in court, they finally obtained the FBI’s internal policies for impersonating journalists. The records show that in order to impersonate a journalist, a FBI field office is supposed to submit an application to do so with the Undercover Review Committee at FBI headquarters and it must be approved by the FBI Deputy Director after consultation with the Deputy Attorney General. “We’ve understood for a long time that the FBI engages in this practice, so I think it’s helpful for the public to understand the internal rules it utilizes when engaging in it,” said Jen Nelson, a staff attorney at RCFP. While we know the FBI has impersonated members of the press on multiple occasions, it’s possible that other agencies have also done so as part of their operations. Freedom of the Press Foundation has filed FOIA requests with over a dozen other federal agencies seeking more information. RCFP continues to work to uncover the details and frequency of the FBI’s use of the tactic, which poses huge chilling effects for journalism. The FBI should immediately halt its use of the tactic, which poses real and significant dangers to journalists, who may have to deal with suspicion of being federal agents while going about their work. And the public also suffers when sources may be more reluctant to bring critical information to the press because they may not know who is a real journalist and who is fake. If the agency refuses to do so, Congress has the ability to step in and ban the practice by law. Many lawmakers have defended press freedom in the fact of attacks on it by the president, and this would be a powerful way to protect countless journalists nationwide. This entry was posted in Uncategorized on October 11, 2018 by Camille Fassett. Finding and exploiting bespoke attacks on web applications is, of-course, exciting… but I find that performing the most simple of attacks, but as efficiently and effectively as possible, can also feel pretty damn rewarding. The task shares huge commonality with offline password cracking; where performance and strategy are everything. Much like a lot of my colleagues who are totally hooked on password cracking, i find the problem of effective web brute-forcing a seriously under-appreciated art. As a rather contrived example, let’s say we wanted to brute-force Wikipedia pages looking for the word ‘Luftballons’. We’ll start with our base URL of https://en.wikipedia.org/wiki/0 (that’s a zero), and increment 0 until we find ‘Luftballons’, on page 99. Execution time: 13.9255948067 seconds. Horrendously slow. The gzip and deflate transfer-encodings are supported, so we can receive compressed server responses. This means there is less data on the wire, and we can move more of it in the same amount of time. The benefit is far superior to the processing time required to pack and unpack the server responses. Persistent DNS. Contrary to what I have read on StackOverflow, using Requests with a single TCP connection does not appear to trigger DNS resolution on each request, it seems to do it once. If you can imaging having to do a full DNS resolve for each request, as some libraries might, the performance hit would be significant. The problem then, is we are just using Requests really inefficiently. Execution time: 3.16235017776. Much, much faster. Now if we repeat this attack in Burp, it’ll still have a considerable edge… why? because of threads. For a short attack like this, Burp’s default of 5 threads keeps it in line with even highly efficient code. But the longer the attack runs, the greater the time wasted to creating new TCP connections. A few hours into an attack and you’ve wasted lots of time. Execution time: 0.93794298172. Very fast. Under the same conditions, this will stomp all over Burp; and pretty much anything else you can expect to make without considerable effort. So the main problem with Request, and almost all http libraries, is that they don’t support HTTP Pipelining. HTTP Pipelining is the idea of firing multiple requests through a single TCP connection, without having to wait for each response synchronously. If you look at our last code snippet, it looks like thats exactly what we are doing, but unfortunately we’re not. The Requests library actually locks a TCP connection until it has fully read the response content from the last request. The main reason we are able to get such a big perfomance boost from threads, is that we already have our next requests queued up on the connection and ready to fire the moment it’s available to use by the next worker thread. We’ve effectively just minimised the delay this connection sharing was causing us. Pipelining has its own issues, for example its not supported on all webserver, and connection issues are much harder to deal with if you have bits of multiple requests already in transit. To get around these limitations but still reap the performance of asynchronous requests, we can do one obvious thing: increase the amount of connections. We can wrap our last code snippet into 5 threads of its own. This gives us 5 TCP connections, each working as fast as possible to synchronously fire out requests. This is as close we can easily get to HTTP pipelining, but is arguably a far more stable attack. If you really want to play with true pipelining, take a look at Ruby’s em-http-request. Hopefully this gives you some ideas of how to script basic, yet efficient, brute-force attacks. Don’t assume that because a tool already exists for a job that it means it does it best. As a pen-tester, time is precious and we need to spend it wisely. Note: So burp has no time measurement feature in Intruder, so I created a hack to figure out roughly how fast burp is at making requests. Essentially, I created a jython plugin which registers an extension-generated payload for use in Intruder. When this plugin is called upon to create a payload, it returns an empty string payload, but logs the current time in microseconds to the plugin console. This doesn’t give us the exact that time requests were issued or completed… but does help us figure out how fast burp is generating requests to send, which, alone, is twice as slow as the last example here in all of my test cases. This entry was posted in Uncategorized on October 11, 2018 by hiburn8. This entry was posted in Uncategorized on October 11, 2018 by Javvad Malik. This report is a collaborative research effort by the cyber security authorities of five nations: Australia, Canada, New Zealand, the United Kingdom, and the United States. To aid the work of network defenders and systems administrators, we also provide advice on limiting the effectiveness of these tools and detecting their use on a network. The individual tools we cover in this report are limited examples of the types of tools used by threat actors. You should not consider this an exhaustive list when planning your network defense. Tools and techniques for exploiting networks and the data they hold are by no means the preserve of nation states or criminals on the dark web. Today, malicious tools with a variety of functions are widely and freely available for use by everyone from skilled penetration testers, hostile state actors and organized criminals, to amateur cyber criminals. The tools in this Activity Alert have been used to compromise information across a wide range of critical sectors, including health, finance, government, and defense. Their widespread availability presents a challenge for network defense and threat-actor attribution. Experience from all our countries makes it clear that, while cyber threat actors continue to develop their capabilities, they still make use of established tools and techniques. Even the most sophisticated threat actor groups use common, publicly available tools to achieve their objectives. Whatever these objectives may be, initial compromises of victim systems are often established through exploitation of common security weaknesses. Abuse of unpatched software vulnerabilities or poorly configured systems are common ways for a threat actor to gain access. The tools detailed in this Activity Alert come into play once a compromise has been achieved, enabling attackers to further their objectives within the victim’s systems. The tools detailed in this Activity Alert fall into five categories: Remote Access Trojans (RATs), webshells, credential stealers, lateral movement frameworks, and command and control (C2) obfuscators. This Activity Alert provides an overview of the threat posed by each tool, along with insight into where and when it has been deployed by threat actors. Measures to aid detection and limit the effectiveness of each tool are also described. The Activity Alert concludes with general advice for improving network defense practices. PowerShell Empire uses "modules" to perform more specific malicious actions. These modules provide the threat actor with a customizable range of options to pursue their goals on the victim’s systems. These goals include escalation of privileges, credential harvesting, host enumeration, keylogging, and the ability to move laterally across a network. There are several measures that will improve the overall cybersecurity of your organization and help protect it against the types of tools highlighted in this report. Network defenders are advised to seek further information using the links below. Protect your organization from malware. See UK NCSC Guidance: https://www.ncsc.gov.uk/guidance/protecting-your-organisation-malware. Board toolkit: five question for your board’s agenda. See UK NCSC Guidance: https://www.ncsc.gov.uk/guidance/board-toolkit-five-questions-your-boards-agenda. Use a strong password policy and multifactor authentication (also known as two-factor authentication or two-step authentication) to reduce the impact of password compromises. See UK NCSC Guidance: https://www.ncsc.gov.uk/guidance/multi-factor-authentication-online-services and https://www.ncsc.gov.uk/guidance/setting-two-factor-authentication-2fa. Protect your devices and networks by keeping them up to date. Use the latest supported versions, apply security patches promptly, use antivirus and scan regularly to guard against known malware threats. See UK NCSC Guidance: https://www.ncsc.gov.uk/guidance/mitigating-malware. Prevent and detect lateral movement in your organization’s networks. See UK NCSC Guidance: https://www.ncsc.gov.uk/guidance/preventing-lateral-movement. Implement architectural controls for network segregation. See UK NCSC Guidance: https://www.ncsc.gov.uk/guidance/10-steps-network-security. Protect the management interfaces of your critical operational systems. In particular, use browse-down architecture to prevent attackers easily gaining privileged access to your most vital assets. See UK NCSC blog post: https://www.ncsc.gov.uk/blog-post/protect-your-management-interfaces. Set up a security monitoring capability so you are collecting the data that will be needed to analyze network intrusions. See UK NCSC Guidance: https://www.ncsc.gov.uk/guidance/introduction-logging-security-purposes. Review and refresh your incident management processes. See UK NCSC Guidance: https://www.ncsc.gov.uk/guidance/10-steps-incident-management. Update your systems and software. Ensure your operating system and productivity applications are up to date. Users with Microsoft Office 365 licensing can use “click to run” to keep their office applications seamlessly updated. Use modern systems and software. These have better security built-in. If you cannot move off out-of-date platforms and applications straight away, there are short-term steps you can take to improve your position. See UK NCSC Guidance: https://www.ncsc.gov.uk/guidance/obsolete-platforms-security-guidance. Manage bulk personal datasets properly. See UK NCSC Guidance: https://www.ncsc.gov.uk/guidance/protecting-bulk-personal-data-introduction. Restrict intruders' ability to move freely around your systems and networks. Pay particular attention to potentially vulnerable entry points (e.g., third-party systems with onward access to your core network). During an incident, disable remote access from third-party systems until you are sure they are clean. See UK NCSC Guidance: https://www.ncsc.gov.uk/guidance/preventing-lateral-movement and https://www.ncsc.gov.uk/guidance/assessing-supply-chain-security. Whitelist applications. If supported by your operating environment, consider whitelisting of permitted applications. This will help prevent malicious applications from running. See UK NCSC Guidance: https://www.ncsc.gov.uk/guidance/eud-security-guidance-windows-10-1709#applicationwhitelistingsection. Manage macros carefully. Disable Microsoft Office macros, except in the specific applications where they are required. Only enable macros for users that need them day-to-day and use a recent and fully patched version of Office and the underlying platform, ideally configured in line with the UK NCSC’s End User Device Security Collection Guidance and UK NCSC’s Macro Security for Microsoft Office Guidance: https://www.ncsc.gov.uk/guidance/end-user-device-security and https://www.ncsc.gov.uk/guidance/macro-security-microsoft-office. Use antivirus. Keep any antivirus software up to date, and consider use of a cloud-backed antivirus product that can benefit from the economies of scale this brings. Ensure that antivirus programs are also capable of scanning Microsoft Office macros. See UK NCSC Guidance: https://www.ncsc.gov.uk/guidance/macro-security-microsoft-office. Layer organization-wide phishing defenses. Detect and quarantine as many malicious email attachments and spam as possible, before they reach your end users. Multiple layers of defense will greatly cut the chances of a compromise. Treat people as your first line of defense. Tell personnel how to report suspected phishing emails, and ensure they feel confident to do so. Investigate their reports promptly and thoroughly. Never punish users for clicking phishing links or opening attachments. NCCIC encourages users and administrators to report phishing to phishing-report@us-cert.gov. See UK NCSC Guidance: https://www.ncsc.gov.uk/phishing. Deploy a host-based intrusion detection system. A variety of products are available, free and paid-for, to suit different needs and budgets. Defend your systems and networks against denial-of-service attacks. See UK NCSC Guidance: https://www.ncsc.gov.uk/guidance/denial-service-dos-guidance-collection. Defend your organization from ransomware. Keep safe backups of important files, protect from malware, and do not pay the ransom– it may not get your data back. See UK NCSC Guidance: https://www.ncsc.gov.uk/guidance/mitigating-malware and https://www.ncsc.gov.uk/guidance/backing-your-data. Make sure you are handling personal data appropriately and securely. See UK NCSC Guidance: https://www.ncsc.gov.uk/guidance/gdpr-security-outcomes. Further information: invest in preventing malware-based attacks across various scenarios. See UK NCSC Guidance: https://www.ncsc.gov.uk/guidance/mitigating-malware. NCCIC encourages you to report any suspicious activity, including cybersecurity incidents, possible malicious code, software vulnerabilities, and phishing-related scams. Reporting forms can be found on the NCCIC/US-CERT homepage at http://www.us-cert.gov/. NCCIC strives to make this report a valuable tool for our partners and welcomes feedback on how this publication could be improved. You can help by answering a few short questions about this report at the following URL: https://www.us-cert.gov/forms/feedback. This entry was posted in Uncategorized on October 11, 2018 by US-CERT. FireEye iSIGHT Intelligence compiled extensive data from dozens of ICS security health assessment engagements (ICS Healthcheck) performed by Mandiant, FireEye's consulting team, to identify the most pervasive and highest priority security risks in industrial facilities. The information was acquired from hands-on assessments carried out over the last few years across a broad range of industries, including manufacturing, mining, automotive, energy, chemical, natural gas, and utilities. In this post, we provide details of these risks, and indicate best practices and recommendations to mitigate the identified risks. Mandiant ICS Healthchecks and penetration testing engagements include on-site assessments of customers' IT and ICS systems. The ICS Healthcheck consists of workshops and technical reviews. It captures the results in a final report that ranks discovered findings and vulnerabilities by risk using Mandiant’s Risk Rating method. During an onsite workshop with site technical experts, Mandiant develops a technical understanding of the subject control system(s), builds a network diagram of the control system, analyzes for potential vulnerabilities and threats, and assists with prioritizing recommended countermeasures to defend the environment. Mandiant also collects and reviews packet captures of network traffic from the ICS environment to validate the network diagram constructed in the workshop and to identify any unexpected or undesirable deviations from the intended design. This traffic is also analyzed for evidence of compromise or misconfiguration of the ICS network/system. Mandiant inspects the deployed security technology for vulnerabilities and other architectural risks, such as inappropriately configured firewalls, dual-homed control system devices, and unnecessary connectivity to the business network or the Internet. NOTE: Findings are discussed at a generalized level to preserve the anonymity of our customers. This post presents a high-level overview and is meant to be an informative first stop for customers interested in common cyber security issues. For more information or to request Mandiant services, please visit our website. This blog post leverages information from Mandiant ICS Healthchecks, which evaluate cyber security risk in organizations from multiple industries. The rating of critical and high security risk is based on the Mandiant Risk Rating System, which is determined by identifying the exploitability and the impact of a given issue, and cross-referencing the results (Figure 1). 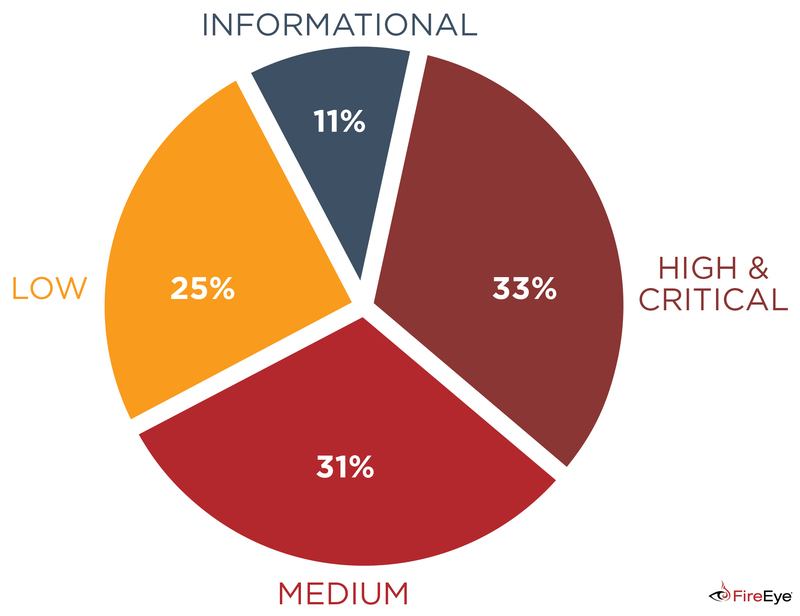 We reviewed findings from all of our risk assessments and then categorized and ranked the reported risks as critical or high, medium, low, or informational (Figure 2). 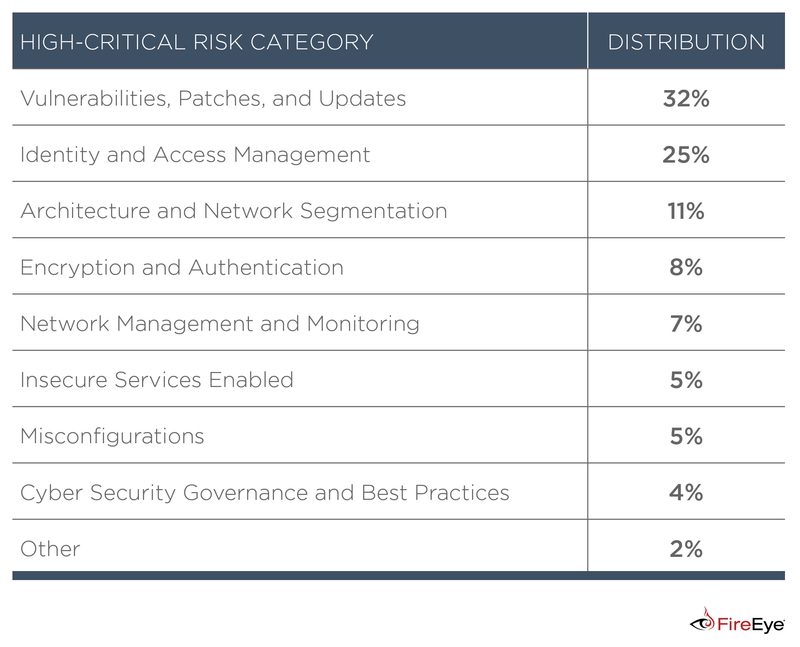 At least 33 percent of the security issues we found in ICS organizations were rated of high or critical risk. This means they were most likely to allow adversaries to readily gain control of target systems and potentially compromise other systems or networks, cause disruption of services, disclose unauthorized information, or result in other significant negative consequences. We suggest immediate remediation for critical risks, and quick action to remediate high security risks. In most of these cases, basic security best practices would be enough to stop (or at least make it more difficult for) threat actors to target an organization's systems. 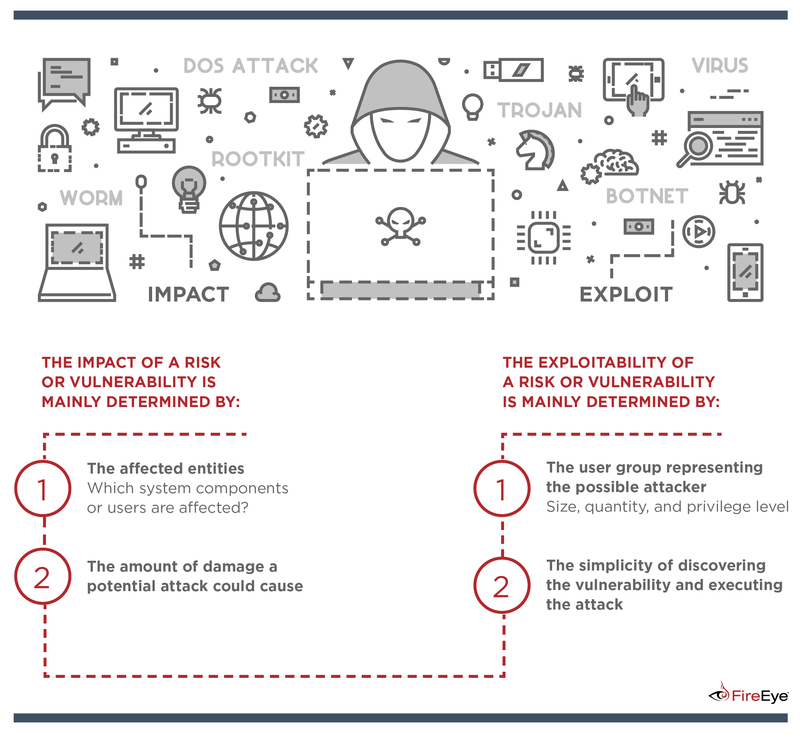 The implications are vast because specialized malware or actors targeting infrastructure would likely look for these flaws first to exploit throughout the targeted attack lifecycle. We encountered organizations with no formal vulnerability and patch management programs. Network devices and systems such as switches, firewalls, and routers. Hardware equipment, including desktop computers, cameras, and programmable logic controllers (PLCs). Unsupported legacy operating systems such as Windows Server 2003, XP, 2000, and NT 4. We observed outdated firewalls with up to 53 unaddressed vulnerabilities and switches with more than 200 vulnerabilities. System management software that can be exploited using known open source tools. Lack of test environments to analyze patches and updates before implementation. Develop a comprehensive ICS Vulnerability Management Strategy and include procedures to implement patches and updates on key assets. More information is provided by the National Institute for Standards and Technology's (NIST) Guide for ICS Security NIST SP800-82. Implement a security perimeter around affected assets, protected by, at minimum, a firewall (industrial protocol inspection/blocking if appropriate) for access control and traffic filtering. Decommission legacy devices that might be exploited to gain access to the network, such as switches. Set up development systems or labs that are representative of the running IT and ICS devices. These systems can often be built from existing spares along with the purchase or loan of additional licenses for human-machine interfaces (HMIs) and configuration software from the system vendor. A development system is an excellent platform to test changes and patches, and on which to perform vulnerability scans without risk to active systems. Users were able to remotely access ICS environments from the corporate network without requiring multi-factor authentication. Weak passwords with insufficient length or complexity used for privileged accounts, ICS user accounts, and service accounts. Passwords were not changed frequently. Passwords were reused for multiple accounts. Passwords were written on the chassis of devices. Mandiant discovered Remote Terminal Units (RTUs) containing default credentials, which are commonly available on the Internet and in the device manuals. A modem contained a backdoor account incorporated by the manufacturer. Implement two-factor authentication for all possible users, especially administrative accounts. Avoid keeping written copies of passwords and, if necessary, secure them out of sight with limited access for only authorized users. Enforce password policies that require strong passwords that are regularly modified and cannot be reused. More information is available from SANS. Avoid common, easily guessed user account names such as "operator," "administrator," or "admin." Instead, use uniquely named user accounts for all access. Require administrative users to log in with uniquely named user accounts with strong passwords, tied back to an individual person. Avoid shared accounts when feasible. However, if present, they should be hardened using strong passwords that are stored in an encrypted password manager. Unfiltered access to plant servers from corporate networks through, for example, a historian communicating with the distributed control system (DCS). Missing segmentation between ICS and corporate networks. Vulnerabilities in bridge devices (e.g., outdated appliances running vulnerable OS) that can enable lateral movement between networks. Business functions (e.g., data backups and anti-virus updates) running on shared control system networks. Dual-homed systems, both servers and desktop computers. Industrial networks connected directly to the internet. Restrict the number of ports, services, and protocols used to establish communications between the ICS and corporate networks to the least possible to reduce the attack surface. Terminate incoming access for both regular and administrative users first in the DMZ, and then establish another session with connectivity into the ICS network. 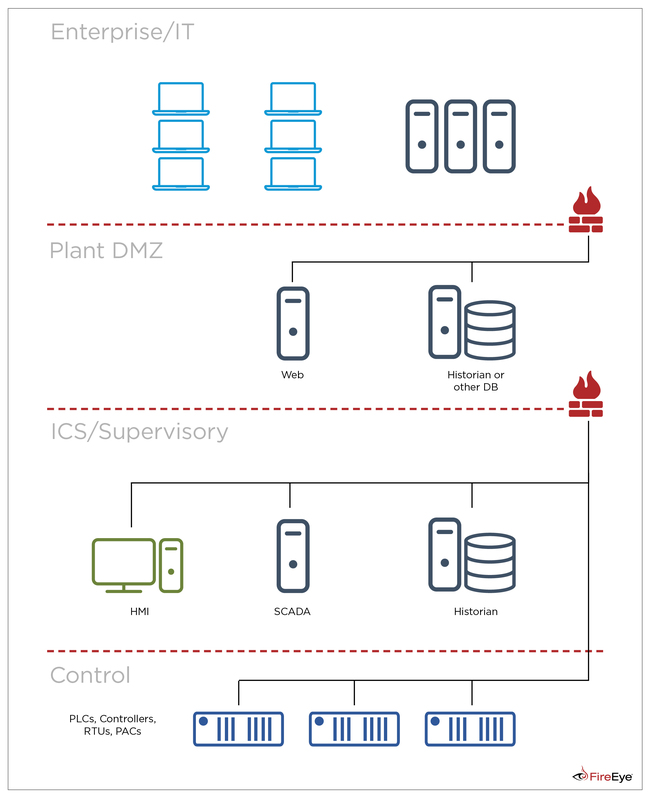 Place servers (or mirrored servers) that provide ICS data to the corporate network in the DMZ. Use firewalls to filter all network traffic entering or leaving the ICS. Firewall rules should filter both incoming traffic from the corporate network and outgoing traffic from the ICS, and they should only allow the minimum required amount of traffic to pass. Isolate the control networks from the internet. A separate network should be used for internet access through a DMZ, and at no time should a bridged connection be allowed between the two networks. Ensure that independent, regularly patched firewalls are used to separate the corporate network from the DMZ and ICS network, and review firewall rulesets on a regular basis. Identify and redirect any non-control system traffic traversing the industrial network. Eliminate all dual-homed servers and hosts. Additional common risks were identified from other categories, but with less frequency. Implement or increase centralized system and network logging to provide visibility across the entire enterprise (IT and ICS). Monitor logs for anomalous behavior. Consider implementing additional host or network-based security controls that generate alerts or reject traffic based on anomalous or suspicious behavior. Install a centrally managed anti-malware solution on all ICS and ICS DMZ hosts. Ensure that signature and application updates are deployed in a timely manner. Explore alternatives for the deployment of an advanced endpoint protection solution that provides detection/prevention for malware and malicious activities that do not rely on signature-based detection methods. Develop procedures to identify and shut down network ports when not in use. Filtering rules should only allow access from/to specific source/destination IP addresses and ports. Filter rules should specify a specific network protocol. ICMP filter rules should specify a specific message type. Filter rules should drop network packets instead of rejecting them. Filter rules should perform a specific action and not rely on a default action. Administrative session timeout parameters should be set to terminate those sessions after a predetermined amount of time. Business expectations, policies, and technical standards for ICS security. Guidance on proactive security controls (e.g., implementation of patches and updates, change management, or secure configurations). Incident Response, Disaster Recovery, and Business Continuity plans. ICS security awareness training plans. Develop a Vulnerability Management Strategy following NIST SP800-82, including asset identification and inventory, risk assessment and analysis methodology (with prioritization of critical assets), remediation testing, and deployment guidelines. This blog post presents a broad picture of the current risks facing industrial organizations as observed during Mandiant ICS Healthchecks. While the trends observed in this research align with risk areas commonly discussed in security conference talks and media reports, this blog draws from dozens of on-site assessments that hold real-life validity. Our findings indicate that at least one third of the critical and high security risks in ICS are related to vulnerabilities, patches, and updates. Known vulnerabilities continue to represent significant challenges for ICS owners that must oversee the daily operation of thousands of assets in complex industrial environments. It is also relevant to highlight that some of the most common risks we identified could be mitigated with security best practices, such as enforcing a comprehensive password management policy or establishing detailed firewall rules. If you are interested in more information or to request Mandiant services, please visit our website. This entry was posted in Daniel Kapellmann Zafra, Homepage Carousel, ICS Security, Latest Blog Posts, Nathan Brubaker, Rob Caldwell, Threat Research, Vulnerabilities on October 11, 2018 by Evan Pena.